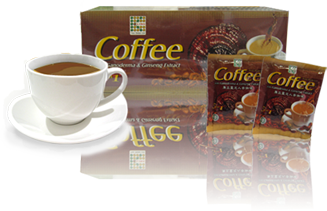 K-Link Arabica Coffee 5-1 is made from a unique blend of high quality Arabica coffee beans, Ginseng extract and Ganoderma extract. Polysaccharide – anti-cancer, immune system enhancer, anti-oxidant, colon cleansing, lowering cholesterol. Triterpenes – simple lipids, known to lower cholesterol, acts as steroid to enhance the body hormones and increase resistance, improves glucose level, anti-allergy and strengthen the liver. Adenosine – improves blood circulation, strengthen nerves and brain functions, energy and inhibits platelet aggregation. Organic Germanium – improves oxygenation of the cell and strengthen immune system. Ginseng – is highly prized as a product that gives body resistance to stress. Revitalizes and aids in recovery from weakness. You will feel alert, energetic and revitalized after drinking K-Link Arabica Coffee 5-1 with its wonderful refreshing aroma that makes you totally rejuvenated. A beverage drink to start and perk your day.